Please got to Grill It With Bobby Flay and find my video. It's called California to Colorado Taco Tour and view the video and please give me a 5 star rating. I would love to get on this show and Grill with Bobby Flay. world, Parmigiano-Reggiano. It was a good night. 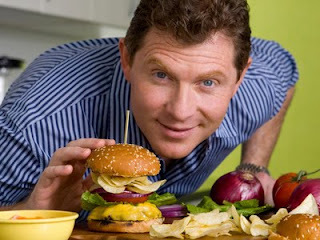 This weekend I will be making a video to send to "Grill It With Bobby Flay". My wife will be working the camera and I will be making some Grub. I think I'm going to make Tacos. They said you should make something that represents your background and cooking history. I'm thinking Shrimp and Chorizo tacos with a tangy Tomatillo Salsa and Striped Marlin Tacos topped with a Cilantro Broccoli Slaw. Both will be served on fresh homemade Corn Tortillas that I will grill. 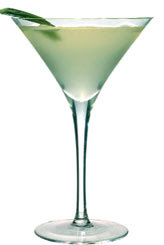 I'm also going to make a Blanco Tequila Cucumber and Honeydew Mellon Margarita. I spent a lot of my early years fishing the Sea of Cortez with my dad and I think these tacos will be a good representation of those amazing times in my life. As soon as we have it finished we will post it to the blog. Then I will post the link so you can all vote for me. Here's my new Egg! Can't wait for Roy to build my table for it. 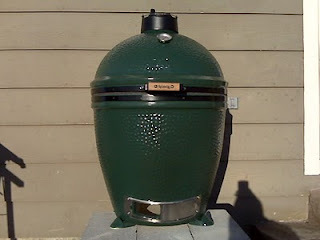 When Shannon first told me about the Big Green Egg, my response was..."big green what?". He sighed and patiently explained to me that it's just the best grill/smoker/bbq EVER. I still wasn't convinced until he took me to Lehrer Fireplace and Patio. We talked to the experts there for over an hour and when we left, I knew that this was the one. 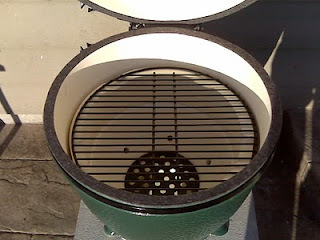 I was thinking about getting another Weber gas grill, but the benefits of the Egg blow it away. Thanks to Lehrer for taking great care of me. They definitely know their stuff. 1. Use a lot more charcoal and/or more fire starter to generate a hotter fire more quickly. 2. Make sure I keep the dome open while the fire heats up. I had no problem getting it up to 350 degrees, but it didn't get much hotter than that because I had closed the dome too early. Linda, at Lehrer, mentioned that with our lack of oxygen here, she found that she needed to keep the whole dome open until the fire was hot, otherwise it wouldn't get hot enough. Of course, I had forgotten that until after I was done. Oh well, I can't wait to make some steaks or pizza on it! I've always known that my brother Grant is a good cook, but in the last year or two, I've come to appreciate just how good he is. He, like me, says "hey, I just follow the recipe", but we all know it takes skill to execute a recipe perfectly. It also takes skill to know when to change a recipe for the better. The other dish he made that night was grilled lamb with salsa verde. He marinated the lamb in the salsa verde overnight and then served more on the side. 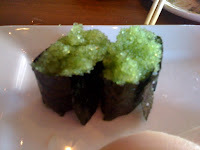 I couldn't stop eating it, it was so good. The salsa plays on the old combination of mint and lamb, but trust me, this is NOT the same mint-jelly-lamb combination. The fresh mint and balance of flavors was perfect and would go well with just about any grilled meat. It's a Channel Knife. It's great for garnishing drinks. It makes me look like a pro behind the bar. Shannon found Frank's blog the other day. 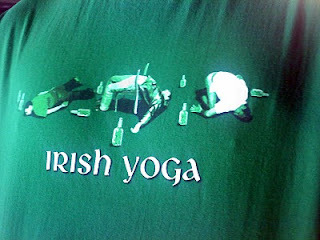 We love this guy... http://blog.frankbonanno.com/index.php?blog=1 ...he-he-he... a little bit different class than ours, eh? ...but not just any ham and cheese. My wonderful wife bought me a Breville panini press for Valentine's Day and I didn't waste any time trying it out. We went to Whole Foods (I forgot how expensive that place is!) and bought our favorite bread (a boule of Rustic Italian), our favorite ham (Niman Ranch Applewood Smoked...so good), and an assortment of cheeses. Tanette had some cheddar on hers and I made 1/2 of mine with Comte' and 1/2 with Manchego. I actually didn't like the Comte' too much just by itself, but in the sandwich it was really good. The saltiness of the ham balanced out the strength of the Comte'. The Manchego side was really good as well, still flavorful, but not as strong. I invented this drink over the weekend, IT IS AWESOME!!! We finally got a Sprouts in Castle Rock so we raided the produce section for fresh produce to come up with something delicious. I'm so sick of the sugary pre packaged mixes on the market today. A long time ago I started making my Margaritas from scratch and there is no comparison. Mixologists everywhere are trending toward fresh produce to make their drinks. I think this is my new favorite mixed drink. I could use some help thinking of a name for it. The content below is from a Denver Post story. I've heard about it a few times and it sounds like a great idea. "Thought of stuffing stockings with a deck of dinner discounts? Then look no further than the dining deal from Denver's best independent restaurants. For $50, you get $520 in dining deals. Each of the 52 cards is good for $10 gift certificates redeemable at members of the nonprofit DINR. Top restaurants include Vesta Dipping Grill, Rioja, Mizuna, Mezcal, Black Pearl, Panzano, Il Posto, Table 5, Elway's Cherry Creek, Parallel 17, Racines, Olivea and The Avenue Grill. The cards are valued from New Year's Day through New Year's Eve 2010, with the exception of Denver Restaurant Week in February. Proceeds go to support Denver's independent restaurants. DINR's mission is to "support, encourage and promote independent restaurants and chefs, which are the soul, spirit and identity of Denver, through education and the formation of a restaurant network."" I saw the movie, Julie and Julia, last night. Let me tell you, this is NOT a movie to watch late at night when you're hungry! Oh SNAP! seriously, that's the sound they make when you bite them. SNAP! 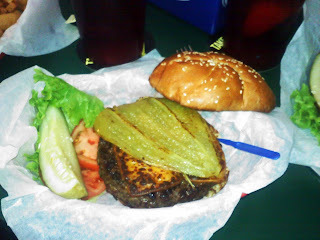 I saw these pickles on The Food Networks "The Best Thing I Ever Ate" so I had to try them. Ted Allen was right, they're awesome. The Spicy ones are the only one I have tried so far and yes they are spicy. I am a spicy food lover so I didn't mind them at all. Probably one of the most addicting things I have ever eaten. 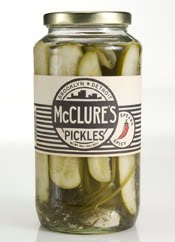 Spicy Pickles – Intermingled with cayenne and habanero peppers, these pickles have a kick. Layered, bold flavors and incredible crunch make for a unique pickle unlike others. Use the leftover spicy brine to make a killer bloody mary mix or as a marinade for cooking. You can also refill the jar with some small pickle cucumbers and voila you have more pickles in a few weeks. The only place here in Colorado you can get them that I know of is Williams - Sonoma. Any volunteers who would like to go in on a case? 1. In a blender, add lots of fresh basil and puree with good olive oil and a bit of salt (remember, use Kosher or Sea Salt). 2. Let it sit for awhile so the flavors can really blend. Optional. 3. In batches, pour mixture through a sieve into a bowl, pressing the mixture with a spatula to get all the liquid out. 4. Using a funnel, transfer oil to a glass olive oil bottle. 5. Great on chicken, caprese salad, bread, or just by itself! **Made Rick Bayless' Chorizo Queso again yesterday. It's supposed to go with corn tortillas, but I usually just serve it with good corn tortilla chips. Everyone gobbled it up! **Made boneless buffalo chicken the other night. Wasn't happy with the goopy flour mixture, but they turned out great! Loved the flavor of them without the extra dose of hot sauce at the end. It kinda ruined the overall flavor, but adding the hot sauce into the flour mixture was an awesome idea. I use recipes from these guys all the time. I like their explanations of why things work or don't work. **Oh, and me and Shannon are getting Big Green Eggs soon. Can't wait!! !